Lit Wave 2012 Wrap-up Video! Pacifica Currents host Edie Hovermale interviews guests Sue Beckmeyer and Gail Benjamin about the Pacifica LIT WAVE, a 3-day celebration of words (episode #230). 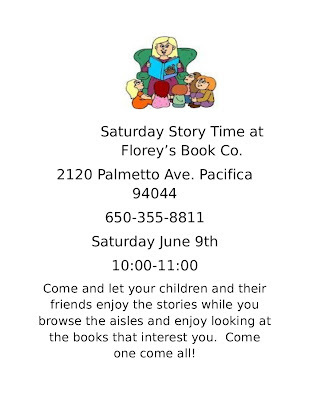 Local authors, poets, storytellers and musicians are coming together across Pacifica for three days of creative festivities. There are events for the young and young at heart, in venues indoors and outside! All events are free and open to the public. 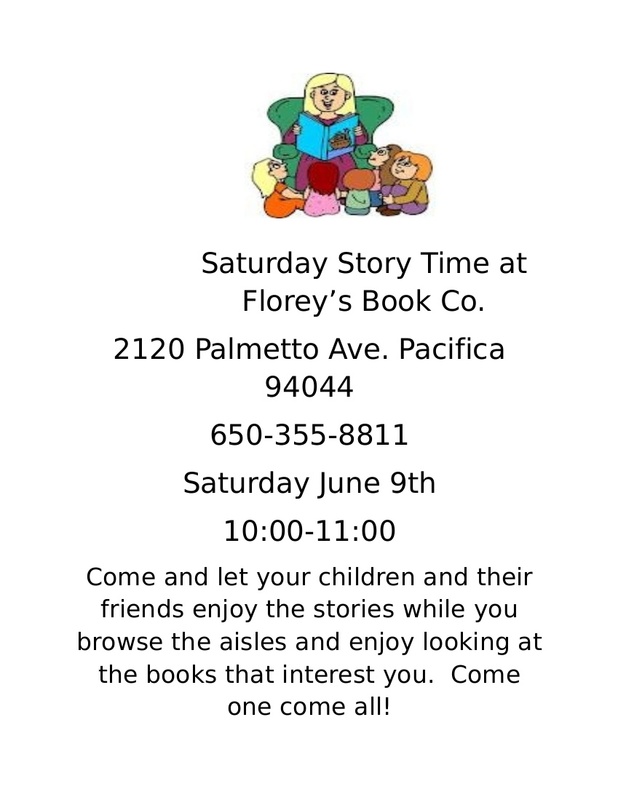 "The Ninja Librarian" author event Saturday, June 9th, 2-4pm! Florey's Books welcomes local author Rebecca Douglass as she discusses her new young adult novel "The Ninja Librarian". 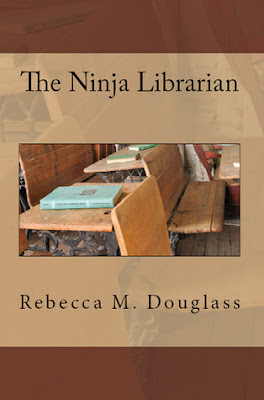 The Ninja Librarian is a humorous set of tall tales set in the highly fictional gold-country town of Skunk Corners. It’s the story of a dusty, tough, unfriendly town that gets a new outlook on life thanks to the advent of the Ninja Librarian—a mild-mannered librarian who offers his wisdom with a little extra when folks don’t listen. The stories appeal to readers of all ages, from middle-elementary to adult and beyond. Rebecca Douglass mostly resides in Daly City, California, with her husband and two teenaged sons. Her imagination resides where it pleases, in and out of this world. After a decade of working at the Westlake library, she is still learning the secrets of the Ninja Librarian. Ms. Douglass is a long-time volunteer at the schools, including most recently at Oceana H.S. in Pacifica, and serves on the Jefferson Elementary School Board. 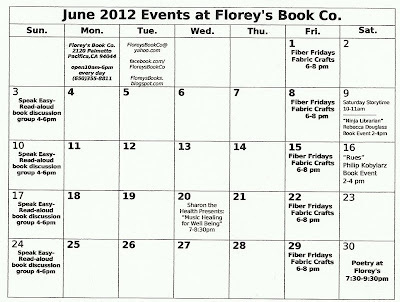 June 2012 Calendar of Events at Florey's! 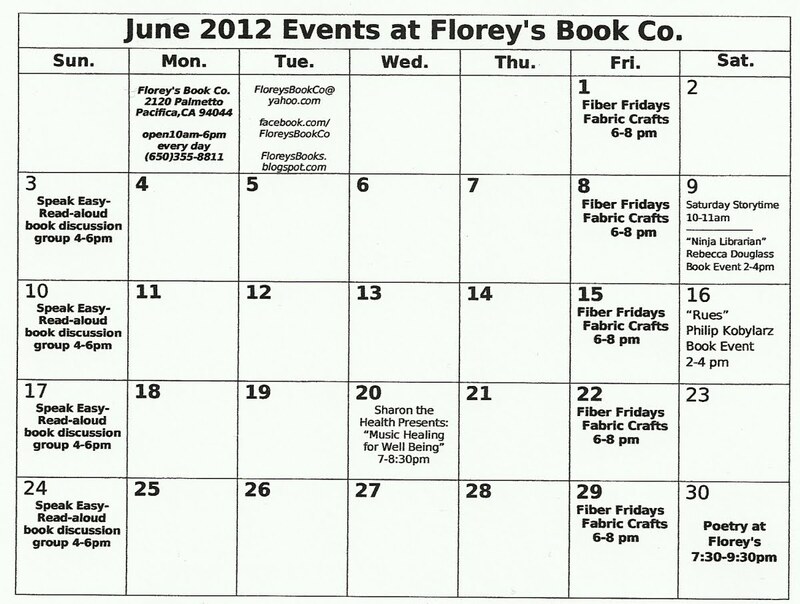 Here is the June 2012 calendar of events at Florey's Book Co.
All varieties of string and fabric crafts are welcome! Day and time have changed! Come share a fun or exciting passage from a new or old favorite book. Featured poets, followed by an open mic period. Share your poems, or just listen. 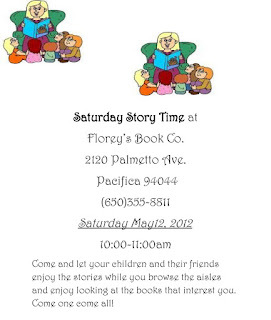 "With the Sea Beside Me" author event, Sat. May 19th! 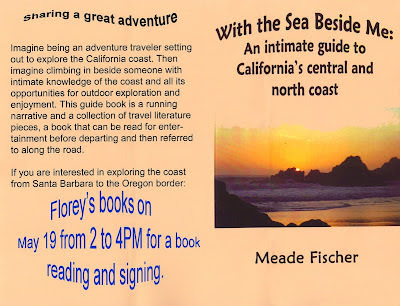 Florey's Books invites you to share a great adventure with author Meade Fischer as he reads and signs his book "With the Sea Beside Me: An Intimate Guide to California's Central and North Coast". Imagine being an adventure traveler setting out to explore the California coast. Then imagine climbing in beside someone with intimate knowledge of the coast and all its opportunities for outdoor exploration and enjoyment. This guide book is a running narrative and a collection of travel literature pieces, a book that can be read for entertainment before departing and then referred to along the road. If you are interested in exploring the coast from Santa Barbara to the Oregon border, join author Meade Fischer at Florey's Book Co. The featured poets this month are: Jan Dederick and John Rowe. The featured poets will be followed by an open mic period. Open mic sign-up is first come, first served. This event is also open to the public and free of charge. 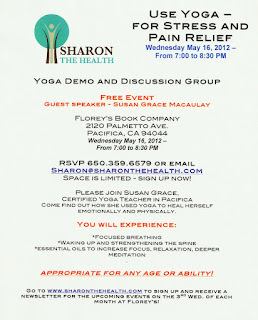 Sharon the Health Presents: Yoga for Stress and Pain Relief, Wed. May 16th at Florey's! Sharon Caren of Sharon the Health presents a yoga demo and discussion, with guest speaker Susan Grace Macaulay. 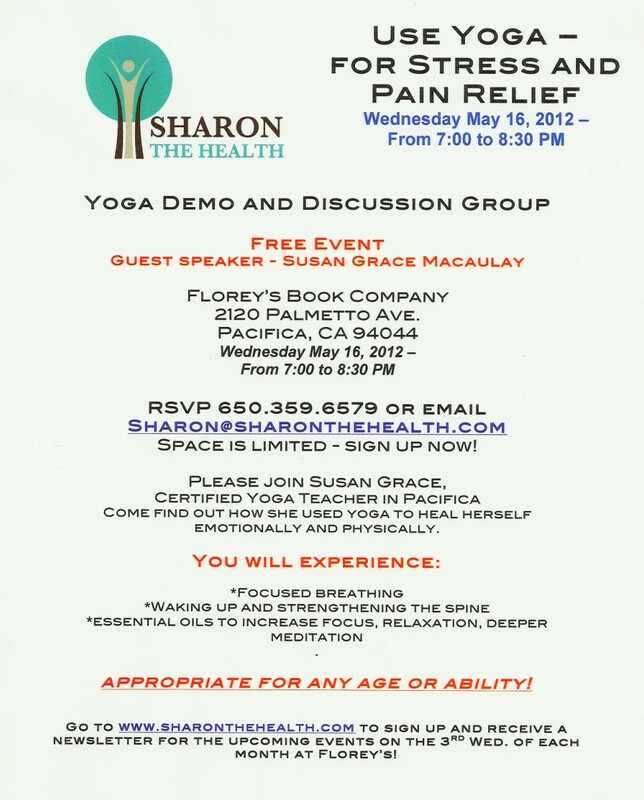 Join Susan Grace, certified yoga teacher in Pacifica. 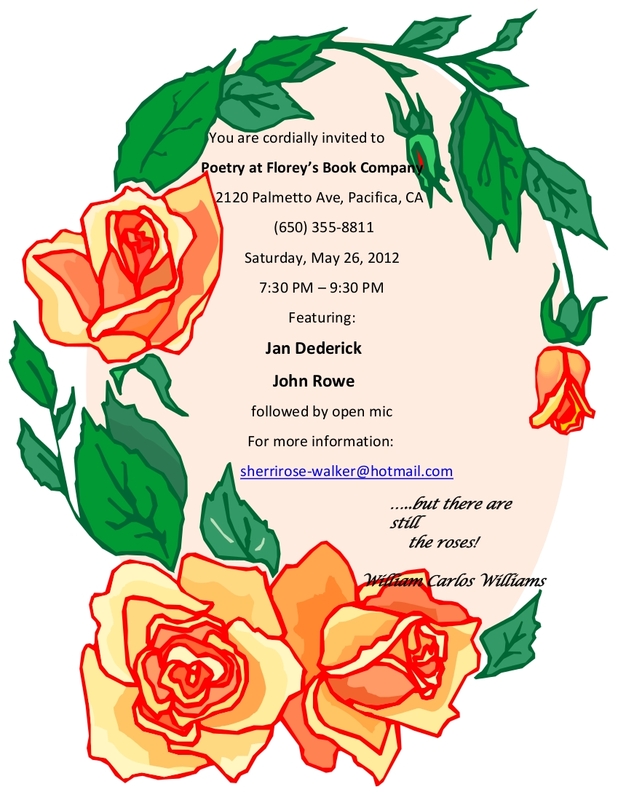 Come find out how she used yoga to heal herself emotionally and physically. 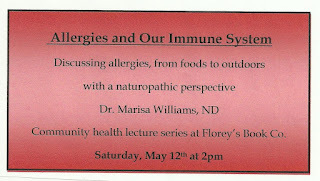 'Allergies & Our Immune Systems' with Dr. Marisa Williams, Sat. May 12th at Florey's! 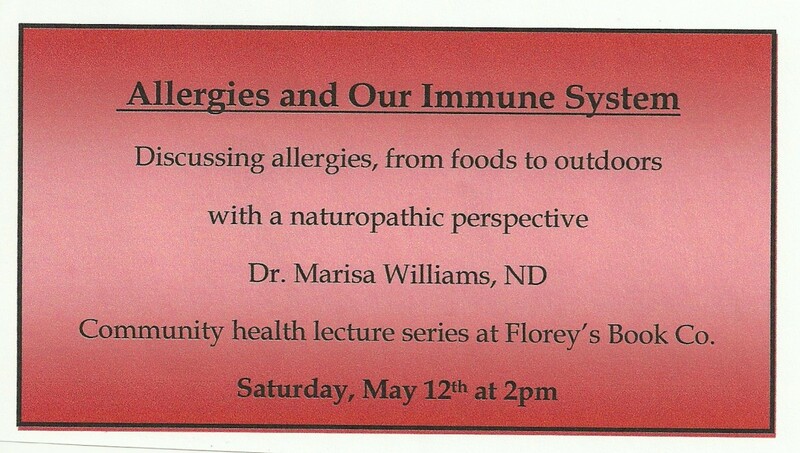 Join Dr. Marisa Williams, a Naturopathic Doctor presenting a community health lecture at Florey’s Book Co. She will discuss the topic of allergies and strengthening the immune system, with a nautropathic perspective. This event is free and open to the public. Bio: Dr. Marisa Williams is a licensed Naturopathic Doctor at Pacifica Naturopathic Medicine. Her practice focuses on naturopathic medicine with an emphasis on women’s medicine, pediatrics, chronic diseases and auto-immune disorders. She is a member of the American Association of Naturopathic Physicians, American Botanical Council, Pediatric Association of Naturopathic Physicians and California Naturopathic Doctors Association.